A well put together, functional and balanced female, M605 had excellent calving ease with positive fat traits. 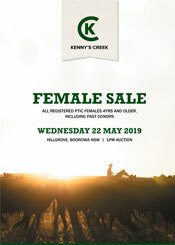 A Kennys Creek Docklands daughter, with Jedda maternal line that breeds frame. Sold pregnancy tested in calf to Esslemont Lotto L3 with an AI female fetus.